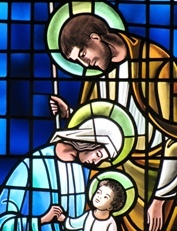 Warm greetings to all from the St. Joseph&apos;s faith community! Whether you are new to our parish or have been a long-time member, we welcome you to St. Joseph&apos;s church. It is my great hope that you always experience the hospitality and warmth of our parish community. Experiencing and sharing the love of Jesus is our vision and hope today. May all the current ministries, activities, and programs of our parish community be anchored in our longing to be immersed in the mystery of God&apos;s love. We are a diverse parish, including many families, singles, and seniors. St. Joseph&apos;s operates our own parish school serving grades K-6. In fact, ongoing Faith for Life is a constant theme that runs through our worship, our ministries, and our school programs. Each parish member, regardless of age, is encouraged to take one more step on our faith journeys, learning more about the word of God, and its relevance to us each day in our homes, our schools our workplaces, and throughout our community. We&apos;re a big parish with an even bigger heart, and there are many ways for you to find your place of belonging here. Opportunities abound for spiritual development, service outreach and social interaction. Take some time to explore our website, where you will find information on the many organizations, activities and services of St. Joseph&apos;s.
We are here to assist you and to make you feel welcome. Do not hesitate to call, email or stop by to talk with us. Thanks!